Entry by Mystery Shadows on Wed Feb 2 07:45:18 2011. Hmm I wonder what Blue(or Green, whatever) is fighting? Anyone else see that the tree's been cut in half? XD Ahaha, I love how you can see Suicune's crest in the corner and Eusine's spazzing out about it. 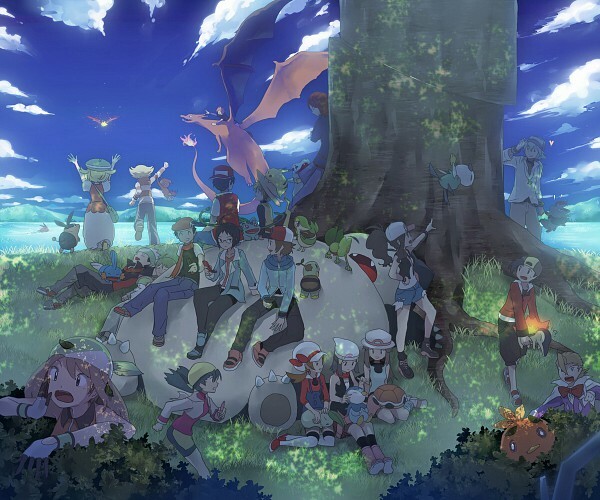 I don't think White is pointing N. I think she is giving the order to Oshawott to cut the tree, and indeed the poor zorua is trying to warn N... love is blind, isn't it? what is Sapphire looking/shouting for? oh and whats the thing in the water by the flying off Ho-oh? i wonder if anyone else noticed the red gyarados in the lake. I see what Saur's doing -_- Vines look carefully at Bulbasaur! ^ She's not in a game/special. Well, she is, but not like the others. 1. Oshawott's scalchop (or however you spell that) just cut that entire tree trunk! 3. I think it's Red Gyrados in the lake. 4. Ho-Oh flying off in the distance. 6. I don't know who, but someone's riding Charizard. 8. I think Ethan/Jimmy/Gold is scared by Oshawott and Hilda/Touko/White. Green is riding the Charizard and chasing after Ho-oh. lol Bulbasaur! And Kris heard Eusine freaking out about Suicune and she is going over there to try and catch it. Wally's becoming a real professional in camouflage now isn't he? Ahhh~ I love this picture. It calms me sometimes. Sees Yellow: Why are you even here? Not hating on her or anything.... just why is she here? ?